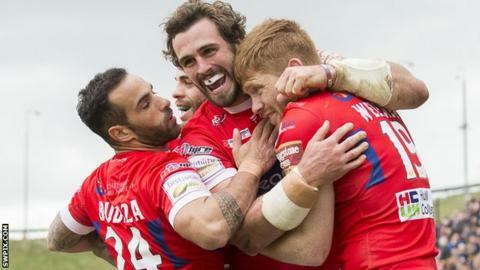 Josh Mantellato's hat-trick maintained Hull KR's 100% record in The Qualifiers with a convincing 34-12 win against Halifax. The Challenge Cup finalists scored six tries and were never truly troubled by a brave Fax side that replied with two scores. Mantellato added five goals to his treble in addition to Tyrone McCarthy, Ken Sio and Kris Welham tries. Dane Manning and Steve Tyrer crossed for Richard Marshall's visitors and Tyrer kicked two goals. Rovers are unbeaten in three matches since reaching Wembley with victory against Warrington earlier this month. Hull KR: Cockayne; Mantellato, Welham, Salter, Sio; Blair, Chisholm; Walker, Lunt, Puletua, Larroyer, Horne, McCarthy. Replacements: Burke, Allgood, Greenwood, Green. Halifax: Johnston; Saltonstall, Heaton, Tyrer, Potts; C Robinson, Murrell; Tangata, Kaye, Cahalane, Manning, Barber, Fairbank. Replacements: Maneely, Ambler, Bracek and Moore.